Christmas in Spain is quite a treat. There are celebrations and religious services from mid-December through January 6. There is the giant multi-billion euro lottery, splendid nativity scenes, lots of great food, and one of the biggest New Year's Eve celebrations you are likely to see. As early as October, traditional sweets such as turron, an almond and honey confection, and marzipan appear in supermarkets. But the real events start in December. 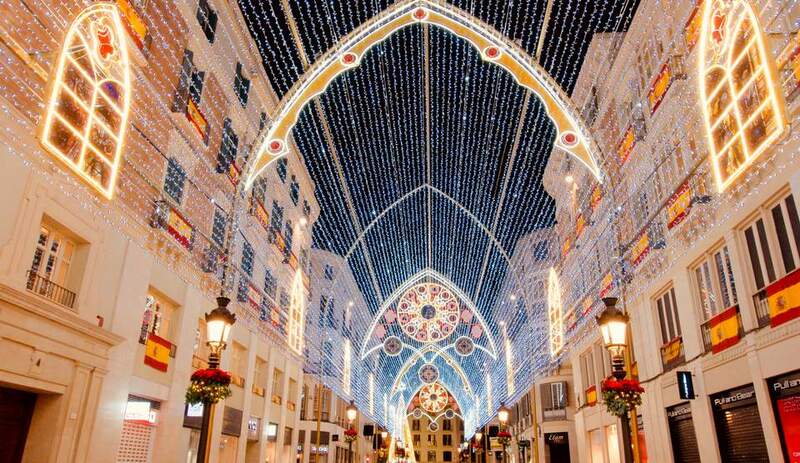 The weather in Spain is chilly but December is a festive time to visit Spain. When you plan your travels there are several important days to be aware of. December 8 - Inmaculada is the religious celebration that signals the beginning of the Christmas season. The name refers to the Immaculate Conception of the Virgin Mary and is a celebration most popular in Seville. Inmaculada is the Patron Saint of Seville, where musical groups from the university, known as tunas, gather around the statue of the Virgin Immaculada in the Plaza del Triunfo (behind the cathedral) in traditional dress and sing songs. On the morning of December 8, children dance the Danza de los Seises (Dance of the Sixes), a custom originating in the 16th century, in the square. December 12 - Noche Vieja Universitaria (University New Year's Eve) is celebrated in Salamanca. Since all the students are away from their friends for Christmas and New Year's, they gather together in Plaza Mayor for an early New Year's celebration. December 13 - El Dia de Santa Lucia, patron saint of the blind, is celebrated. Traditionally the blind would sing Christmas carols in the streets although this is less common now. In the village of Zújar near Granada, bonfires are lighted to celebrate the event. The Santa Lucia festival is actually a major Scandinavian festival and so where there is a high concentration of Scandinavians, such as in Las Palmas in Majorca and on the Canary Islands, there are often several days of festivities focusing on Santa Lucia. December 22 - The Christmas Lottery takes place. "El Gordo" (the fat one) is the biggest lottery in the world and one of the oldest, having started in 1812. All of Spain stops for the big draw on December 22 and the lottery, which tends to be played by groups as the price of tickets is so high, has turned around the fortunes of whole villages. December 24 - Christmas Eve (Noche Buena in Spanish). December 25 - Christmas Day (Navidad in Spanish). December 31 - New Year's Eve (Noche Vieja in Spanish). January 6 - Three Kings Day, or Dia De Los Reyes in Spanish, is the day the children of Spain receive presents. You can take in winter sports or head for the coast. Christmas and New Year's will be celebrated throughout Spain, often in a different way in each region. If you are looking to keep busy, head for a larger city. As much of Spain shuts down at Christmas time in Spain, you'll need to visit one of the bigger cities to be sure of things to do. Try Barcelona, Madrid, Valencia, or Malaga. For a warmer holiday, you can plan a trip to the coast. The south coast of Spain will be the warmest at Christmas, but don't expect beach weather. The Costa del Sol, the Canary Islands, and Malaga are the best places for winter sun in Spain. Winter sports and Christmas go together. A white Christmas is not likely in Spain's cities. The most likely place for a white Christmas would be at a ski resort, particularly in the Pyrenees. Spain's coldest cities are Burgos and Leon, with Cuenca close behind although they often do not have snow. Spain's Christmas doesn't end until January 6, which is Three Kings Day, especially important for children as traditionally their gifts have come on this day. You can buy El Gordo lottery tickets and wait for the big draw on December 22 or watch the excitement build and join in with the holiday customs. Christmas Markets are set up in many major squares to sell small gifts, ornaments, and food. The best place to go in Spain for Christmas markets is Barcelona, because of its unique Catalan Christmas traditions. Christmas dinner, the biggest meal of the season, is enjoyed on Christmas Eve. Christmas Eve dinner is usually the biggest meal of the year. In the past pavo trufado, turkey stuffed with truffles was a popular dish. Now the only rule for the Christmas Eve meal is that people eat well. Lobster is very common, and a roast of some sort is essential, usually lamb or a suckling pig. In addition, most families will also have soup, usually fish stew, and an abundance of other seafood, cheeses, hams, and pates. Visit a Nativity Scene as the people of Spain go all out with their nativity scenes termed Belem in Spanish, which means Bethlehem. The scenes include the whole town of Bethlehem and its inhabitants, extending out to the countryside. Spain's Christmas doesn't end until January 6, which is Three Kings Day, especially important for children as traditionally their gifts have come on this day. So it's a day when you can give or receive gifts or candy from the Three Kings. Christmas Eve in Spain is a family affair. Most bars will be closed and there won't be many restaurants open. If you can get an invitation to a family celebration, you will be in for a treat as you join in on the holiday feast. Proceedings are interrupted at midnight by the chimes of the local church, calling worshipers to the misa del gallo (Mass of the Rooster), so named because it is said that a rooster crowed on the night Jesus was born. The biggest misa del gallo is at the Benedictine monastery at Montserrat near Barcelona. Adults exchange gifts on Christmas Eve and children will often get a little something, but have to wait until January 6 for their traditional gifts. Christmas Day in Spain is nowhere near as important as it is in some other parts of the world. The Spanish have their Christmas meal on Christmas Eve, and the children have to wait until Three Kings Day to get their presents. Like Christmas Eve, Christmas Day in Spain is traditionally a family day—couples will normally spend Christmas Eve with one set of parents and Christmas Day with the other. However, in recent years more and more people have started eating in restaurants on Christmas Day. Restaurants advertise their Christmas menus well in advance. Reservations are helpful but you can often wait until the week of Christmas to make yours. By the evening of the 25th, most shops and bars are open again. New Year's Eve (Noche Vieja) in Spain is a party night like everywhere else in the world, though the structure is a little different. Events are scheduled according to "Spanish time." Rather than starting early and building to a crescendo at midnight, the Spanish welcome in the New Year either with friends or with family and then go out to the bars at about 12:30 a.m. to have a drink. The partying then continues until about 6 a.m. This tradition was started by some shrewd farmers about 100 years ago when they were left with too many grapes after the harvest. The tradition is that you eat twelve grapes in concert with the twelve bongs of midnight. This is a fun ritual, only spoiled by the fact that it is almost impossible to buy seedless grapes in Spain. In the rush to down a dozen grapes, everyone ends up biting into a seed and making a silly face. If you are going to be accurate in your grape eating you need to know that there are four higher-pitched chimes just before the main ones at midnight (known as los cuatros) that announce the start of the real ones. Make sure you don't start eating your grapes too soon. For every grape you get right, you will get a month's good luck. You could celebrate New Year's Eve in Spain an amazing six times if you really want to, with five times in December alone. The first New Year's Eve in Spain comes in mid-December (usually the second Thursday before Christmas). It is the Noche Vieja Universitaria (University New Year), which takes place in Salamanca. The students pretend it is not mid-December and go through all the usual New Year's Eve traditions, including the famous grape-eating. Next up is midday (not midnight) on December 30, in Puerta del Sol in Madrid, for the ensayo de las campanadas (bell-ringing rehearsal). This is actually the first of three rehearsals that the local organizers do to make sure everything is working for the following day, but this celebration is for those who can't attend the real celebration because of prior commitments or for those who can't handle the idea of all the crowds that will congregate on the actual day. Puerta del Sol is as busy as Times Square New Year's Eve proper. Later on in the same day is often the Campanadas Alternativas para Frikis (alternative bell-ringing for geeks), which takes place at Plaza de Castilla, in front of the Pac-Man tree they have set up there The Spanish friki (geek or nerd) subculture is quite big. Also on December 30, at 8 p.m., the town of Lepe celebrates New Year's Eve early (and they celebrate it again the following day too). Then, of course, comes the real New Year's Eve, December 31. You may be surprised that, for a country famous for its drinking, that most bars will be closed on the stroke of midnight. This is because most people spend time with their families. However, the city's main square will certainly give you that communal New Year's feeling. They still party, but it doesn't start until later. Lastly, there is "New Year's Eve in August," which takes place in in the tiny village of Berchules on the first Saturday of the month. This unique tradition started because a power cut in the mid-nineties meant that New Year's Eve celebrations had to be canceled, so they rescheduled the big event for August. The re-run was such a success that they've done this second New Year ever since.